If leaving your neighborhood for a race isn’t appealing, you could always host your own! 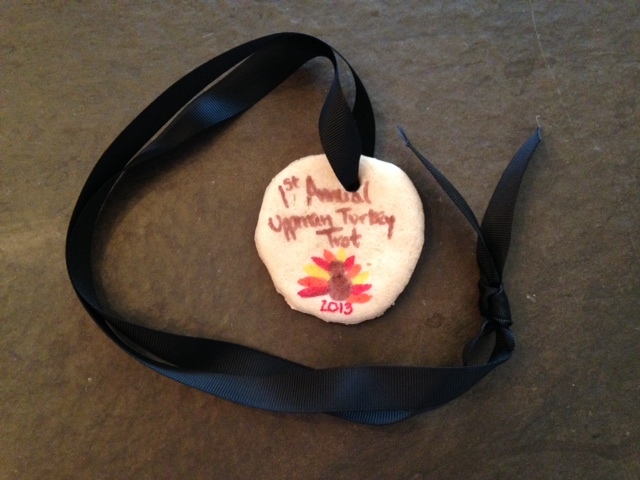 Last November, we hosted the First Annual Uppman Turkey Trot for our local friends. My husband mapped a 3.1 mile route and we sent out the invitations. The night before, I made a batch of salt dough, rolled it out, used a circle cookie cutter and punched out little holes for ribbons. After baking them and threading ribbons through the discs, they were ready to decorate as medals! I kept them blank so each runner could decorate their own. This year we’ll be adding t-shirts into the mix-just a simple design on the front and a place for signatures on the back. It’s a simple way to celebrate your friendship as families before heading off to different homes for Thanksgiving dinner! However you choose to spend your Thanksgiving morning, please remember that Monterey Mommies is thankful for YOU! You inspire us to seek out the best that Monterey has to offer for families, which in turn gives our family more fun every day. Happy Thanksgiving, all!